Note: This program is only for grub-legacy (0.9x). Current grub versions, 1.98+, are supported by more recent grub-choose-default versions, see GrubChooseDefault. Do you have a dual boot system? Isn’t it annoying when you want to reboot from Linux into Windows or vice-versa, and you have to wait for the machine to shut down, BIOS to initialize just so that you can now select the OS that you want to boot into? 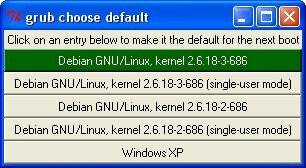 grub-choose-default is written in Python (which is required to be installed at the moment) and works under Linux and Windows. Under Windows you need to get access to your Linux /boot. If you are running ext2/3, then you can use Ext2IFS, which gives you access to your ext2/3 partitions as regular drives under Windows. grub-set-default currently needs this and thus does not work with /boot on reiserfs or other filesystems (unless someone can point me to a similar FS driver as for Ext2IFS). Then grub-choose-default searches all your drives for a grub/menu.lst or a boot/grub/menu.lst. There currently is no way to specify manually where menu.lst resides, please let me know if this is needed. Introduced in version 0.2 is the ability to reboot right after the new grub default has been set. Under Linux there are many different ways to start the logging off procedure — dependent on the desktop environment that you are using. For that reason (and since any program ran through sudo won’t be able to interact with the desktop environment of the regular user), the reboot is handled by a wrapper script. See the reboot/ subdirectory for supplied scripts. At the moment only scripts for xfce4 and gnome have been included, but it shouldn’t be very hard to adjust them to your current desktop environment. If you do so, please email me your script, and I’ll include it in the next release. 2008-05-29 – Version 0.3Applying patches from Kjell Braden to fix minor crashes and to add a man page. 2007-08-06 – Version 0.2Addition of reboot feature, checking menu.lst for correct default saved settings. 2007-01-18 – Version 0.1First public release, please check for bugs! twinview / one big desktop, but rather two X screens. See gentoo wiki for some setup help. I use this setup because the wrapping the mouse is very smooth, it is very useful to have the logical separation of both screens and now I can easily switch focus and mouse between them just by using the keyboard. Additionally, when I play some nice games in wine, I can lock the mouse into each individual screen, and by need be switch by using the keyboard shortcut. Screen          1 "Screen 1" 0 0 #leftOf "Screen 0"
for these utilities to work. mouse position for each screen. The previous mouse-switchscreen has been renamed to mouse-wrapscreen (see below), since the name was confusing. Warning (2010-02-04): Mouse-wrapscreen seems to lock up the X server after a recent upgrade on my system. The symptom is that the cursor will just jump back and forth between screens, preventing any other interaction between the user and the X server. The reason is unknown, probably mouse-wrapscreen is triggering a bug in X. If you have any further information or ideas, please contact the author. respective .c files for a brief changelog. There is switchscreen out there by Sampo Niskanen, however it does not seem to remember the mouse position for each screen. and/or write them out to disk. checksum was found for a file, then the computed one is written to disk. So in the end at the destination every file has a checksum stored on disk, and all files which already had a checksum are verified. 1. The source files / directories have to be specified on the command line. So running just “checkcopy” is not going to get you anywhere. See TODO. 2. The destination is can be predetermined, preselected, or simply selected. chooser will get displayed, starting at the specified URI. This should allow easy bindings in file managers. Before the files are being copied, they are scanned for checksum files. containing checksums. Its contents are then parsed, and remembered. Checkcopy was tested with gtk 2.18.3, but gtk 2.16 would probably suffice. All file operations are based on GIO functions. Required for some utility functions. Please check the TODO file for the current plan for checkcopy. This program is deprecated. Please now use checkcopy, which has more functionality and is more reliable. specified on the command line (-d switch). allows you to verify a whole directory structure copied with md5copy. At the moment md5copy is slightly unoptimized to copy a large number of small files, since the total size of the copy operation is calculated first. The mhash library is used to compute the checksum. This should make md5copy pretty reliable, and at no point in testing there was ever an incorrect checksum. md5copy should be pretty fast. The reading part was inspired by GNU coreutil’s md5sum. GUI, copy and hashing are all run in separate threads, so the hashing should not slow down the copying (although this statement has not benchmarked very well). Ekiga is a nice linux voip program. Yet it has the limitation that its sound support does not understand .asoundrc devices. As a work around you can use an environment variable in .asoundrc to set the default device specially for ekiga. But what if you want to have the ring sound on a different alsa device than the actual conversation? This is what I need with my DotAsoundrc, because my headphones are plugged in all the time. So I wrote a little python script, which uses dbus to connect to ekiga and plays the ring tone on a different device. pidgin-away.py lets you specify a new away message from the command line. Great for usage from within scripts. I wrote it so that when I start a game I can automatically set my status to away, and return to available when I’m done playing. Any questions or bugs, send me an email (contact information is in the script). skype-away.py lets you read or set the current status. Any questions or bugs, send me an email (contact information is in the script).